Although known locally for a sharp tongue and a quick temper, Edgar Degas revealed in his art a tender appreciation for women, in cafes, in the bath, but especially in the ballet. Beginning in the early 1870's Degas sketched ballet dancers in his studio, and then combining the poses onto a stage, depicted the women rehearsing, warming up, talking together or waiting to perform, but rarely actually dancing. 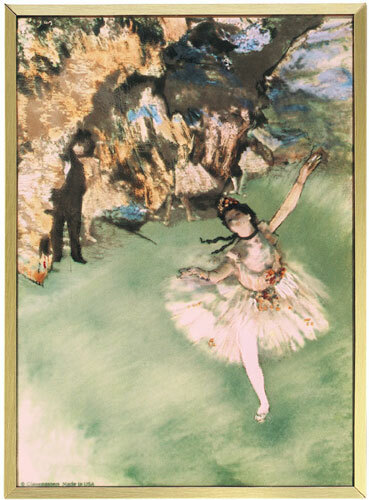 Degas' study of movement, instead of color, set him apart from other impressionist artists of the day. He mastered, then discarded the classical rules of composition and instead experimented with indirect angles of light to hint at the action immediately preceding or following the captured moment. His technique gave his paintings a soft appearance particularly effective in portraying the delicate art of ballet and the romantic rhythms of the dancers themselves.